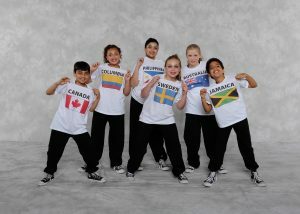 The perfect level for those who enjoy dance and want to explore their creative expression in a fun atmosphere. Each class includes a warm-up consisting of exercises to help dancers improve flexibility, strength, balance and agility. Students will also learn progressions across the floor and various steps to be used in their performance routine. In the last third of the class students will learn combinations each week and will later learn a choreographed routine that will be performed in the year-end show held at the Algonquin Theatre. Students rehearse weekly for their chance to perform on a professional stage. Our recreational program offers Jazz, Tap, Ballet, Lyrical, Contemporary, Dance Acro, Hip Hop and of course a much sought after KinderSteps Program for our 3 & 4 year olds. A Mom & Tot class is available as are Adult Classes throughout the week.